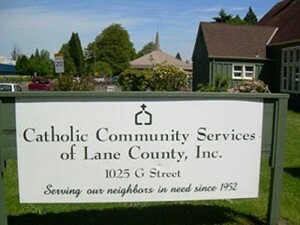 EUGENE – Catholic Community Services of Lane County hosted its annual “Christmas Coffee” for homeless and low-income people on Christmas. In a tradition of more than a decade, Catholic Community Services opens its doors on Christmas Day to provide a hot meal and a warm place to celebrate Christmas with staff, volunteers and friends. Guests could used stamped postcards to allow guests to send a personal message to loved ones. A Catholic Charities agency, Catholic Community Services serves anyone in need, whatever their religion, race, ethnicity, age, disability or way of life.